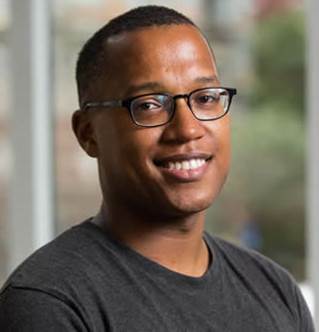 The fall 2018 Sidney Harman Writer-in-Residence at Baruch College is award-winning playwright Branden Jacobs-Jenkins. Celebrating the 20th year of this program, Jacobs-Jenkins is the 40th Sidney Harman Writer-in-Residence at Baruch College’s Weissman School of Arts and Sciences. Jacobs-Jenkins’ plays focus on modern culture based on complicated issues around identity, family, class, and race. Some of his most notable plays include Everybody, Neighbors, An Octoroon, Appropriate, and Gloria. As a Writer-in-Residence, Jacobs-Jenkins is teaching “Playwriting: An Introduction” during the fall 2018 semester at Baruch College. In this introductory workshop, students will read and write a number of one-act plays in an attempt to grasp the basics of dramatic writing. In addition to questions of craft and storytelling, the course will focus on the playwright’s process, the formation of healthy creative habits, and the sharpening of critical skills through reading and responding to the work of both classmates and colleagues in the larger professional field. The course will culminate in staged in-class readings of student plays. Students will be responsible for casting and directing these readings. Jacobs-Jenkins is a Residency Five playwright-in-residence at the Signature Theatre and the recipient of a 2016 MacArthur fellowship, the Windham-Campbell Prize for Drama, and the inaugural Tennessee Williams Award. Jacobs-Jenkins won the 2014 Obie Award for Best New American Play. Jacobs-Jenkins is a graduate of the Lila Acheson Wallace American Playwrights Program at the Juilliard School and holds an MA in Performance Studies from NYU. He is an associate director of the Playwriting MFA program of Hunter College, CUNY. Founded in the fall of 1998 by Professor Roslyn Bernstein, the Sidney Harman Writer-in-Residence Program brings distinguished writers to the Baruch College campus every semester. Whether they are poets, playwrights, novelists, journalists, essayists or critics, the Harman Writers-in-Residence enrich the Baruch environment, creating a lively literary salon for students and faculty. Endowed by alumnus Dr. Sidney Harman (’39), the Harman Program relies on an intense workshop design, where visiting writers teach small classes and hold individual conferences. In addition, the Harman Program sponsors student creative writing competitions, literary internships, individual guest readings, and a week-long residency.